On Saturday evening, my husband and I went to a free concert at Howelson Hill in Steamboat. It was just one of several offered throughout the summer. As I sat and listened to the band and watched the crowd, I was reminded of a 1950s fad. There were a handful of girls and grown women hula hooping to the music! Those ladies were good! They kept the hoop spinning as it revolved around their necks and waists and then when they dropped down to their knees, in a kneeling position, they kept it going. As they stood again, they keep the hoop revolving around their ankles. Never once touching the plastic circle. Wow- quite different than the hula hoops skills I had. And talk about a workout and being creative with a simple circle- some of the moves, I can’t even find the words to explain it! Isn’t it funny how fads, like fashions, come and go and come back around again through the ages? 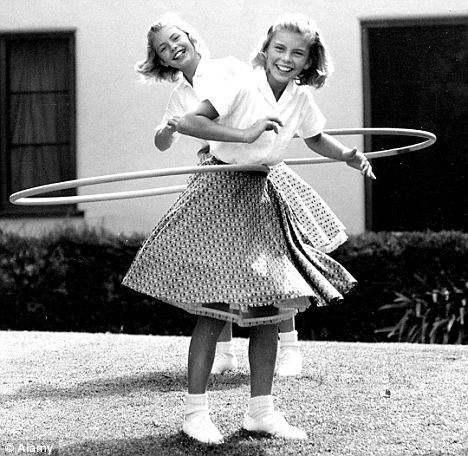 Hula hoops provided many hours of fulfilling fun for me, my sister and our girlfriends. This is just another bit of nostalgia from the gift we humans are given – a lifetime full of memories!